Defra Secretary Michael Gove has admitted farmers will continue to need Government cash after Brexit as food is not always properly valued by the market. He made the remarks during a Food and Drink Federation and NFU event at the Conservative Party Conference in Manchester this week after being questioned about whether he thought food production was a ‘public good’. Though Mr Gove made clear his desire to see the bulk of taxpayer money going to farmers who carry out environmental work which is not rewarded by the market, he acknowledged the problems some farms have when selling food to make a profit. He said: “Public good is a term economists use to describe those things the market would not generate of its own accord. And of course the market is something which is responsible for the distribution of the food which ends up on our plate. “But sometimes the market does not price up all the things we value or the qualities we think are important. 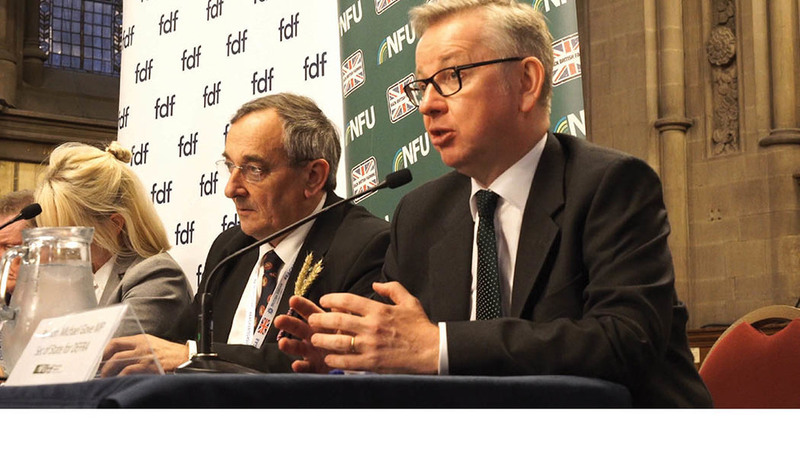 Mr Gove also confirmed his support for new public procurement rules at the event, urging farming groups to push Government to lead the way on supporting British produce. “There is a direct responsibility on Government to ensure as we leave the European Union there are procurement rules to ensure wherever possible British institutions are buying British food,” he said. Ian Wright, Food and Drink Federation director general, responded by challenging the Government to take a more imaginative approach post-Brexit and highlighted how growing and preserving the rural economy was of equal importance both to manufacturing and farming. What else did Gove say? When asked if he would oppose a full neonicotinoid ban in light of his public support for glyphosate, Mr Gove said he did not want to pre-empt any action Government may take. He did add a recent visit to a British sugar factory in Newark, Nottinghamshire, had made it ‘very clear’ the impact a complete ban would have on sugar beet, but said he would first consider all the scientific evidence available. New entrants were thrown in the spotlight as Mr Gove promised to use some agricultural support money to develop a skills base for the future. He said he wanted to ensure young farmers knew ‘exactly how to make the most of their land’ and were offered the incentive to use new technology to achieve greater yields, get more resilient livestock and secure a more effective position for imports and exports. South Thanet MP Craig Mackinlay, who defeated Nigel Farage in the 2015 General Election, caused a stir when he called for unemployed British youngsters to ‘get on their bikes’ and find jobs on farms with ‘loads of gorgeous EU women’. Opposition MPs branded his comments ‘misogynistic and patronising’. Defra Secretary Michael Gove sparked a series of Brexit-related ‘pig’s ear’ jokes after he said leaving the EU provided opportunities for British farmers to sell pigs ears to China. The Minister claimed the UK would be able to have its own traceability methods outside the EU, meaning pigs’ ears did not have to be pierced, increasing their value. Mr Gove’s predecessor Andrea Leadsom told a fringe meeting of young people they should be excited about Brexit because ‘robots will pick your raspberries’. Explaining she voted leave to give her children a better future, she told young people their situation was improving. “There are all manner of things which right now are only a few years away which will become a reality in your lifetime,” she said.